Luminous NXI Grid Tie UPS are power UPS that can feed power from solar panels directly to grid. They are designed to quickly disconnect from the grid if the utility grid goes down (anti-islanding). 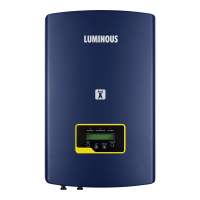 Luminous solar NXI 10 KW On Grid Solar Inverter Luminous NXI Grid Tie UPS are power UPS that can feed power from solar panels directly to grid. They are designed to quickly disconnect from the grid if the utility grid goes down (anti-islanding). The type of operation system of the UPS is known as topology. To Recieve updates and possible rewards for Luminous NXI310 please sign in. To Recieve updates and possible rewards for UPS & Inverter please sign in.